I'm thinking today about small kitchens as we're in the city for the weekend, in our little piece of New York City! I'm also thinking about small kitchens since my daughter is moving to another apartment and is absolutely wild about her new kitchen, also in New York. I can't wait to share that kitchen with you, but that will not be for another month, when they move, assuming the deal goes through, you never know, fingers crossed. So, as I sit in the living area and look toward the kitchen, it appears to me that it's actually a very good sized kitchen for most any cook. When I'm here, I feel, what more does one need? When I think of what I REALLY use in my good-sized kitchen on Long Island with the important disclaimer that I am probably an average cook, average being defined as a GOOD cook (of course!) and one who enjoys cooking, but perhaps not one who cooks with abandon on a frequent basis, needing a batterie de cuisine at my disposal at any given moment, it is helpful to get perspective on what one THINKS one needs, which may be different than every-day habits. That was a run-on sentence if I've ever seen one....yeeesh! 1. Be honest with yourself...what do you really need, what will you really use in regard to cooking equipment? 2. If you want the bread maker and the rice cooker, can they be stored elsewhere in the apartment/home if there is no room in the immediate kitchen area? I don't want you to do without it, but consider alternative storage places...like under the bed or in a closet if you need to. 3. Counter space rules in a small kitchen. It sounds obvious but bears repeating: Put as much away or on shelves as possible to keep your countertops clear. I think all of us are surprised at how quickly we get used to items accumulating on our countertops. 4. If possible, put the paper towel holder on the sink cabinet door as well as a basket for the liquid soap and sponge. A pull out towel rack can be fitted in a very small space in the sink cabinet as well. 5. Periodically, every few months, take stock of your pantry items and organize them. You will be more likely to use those items which previously could not be seen and not buy duplicates. Organize them as to size or type, whatever works. 6. Do the same for the refrigerator. You are less likely to buy those extra condiments if the refrigerator is well organized. Organize by size or type. 7. Think about removing pantry food items and storing them the new old-fashioned way to save on storage space - in Tupperware type containers. 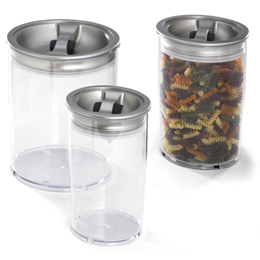 Also check out Rubbermaid, and the Container Store. 8. Everything should have a home. Again, it seems obvious, but the home for all items and categories of items should be clear and obvious so accessibility is quick and efficient. 9. Have a nearby closet? 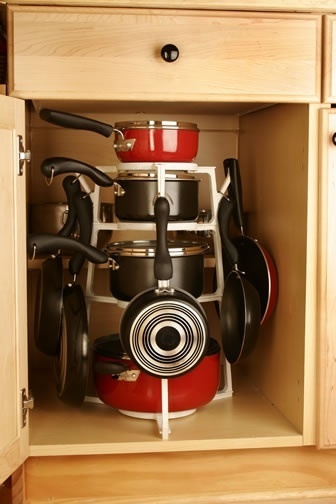 Use the inside door as a spice rack, hanging spot for pots on a wire grid, flat pans, or other tools for easy access. 10. Organize pots on this handy item, the Pantree. Use roll out shelves were possible in base cabinets. A Pantree on a roll out shelf sounds great to me! This is not meant to encourage you to pack in all the storage you can in your kitchen. Just as in any size kitchen, I want you to carefully consider, probably more so than one would in a large kitchen, the equal importance of aesthetics. If a bit of storage needs to be sacrificed for a decorative item like a painting or shelf with a few items for display, make that sacrifice, please! I want you to be surrounded with a meaningful and aesthetically pleasing kitchen interior. I cannot overstate my opinion on this. A small kitchen should not be solely utilitarian....just because it is space challeneged. You deserve both, aesthetics in regard to personal decoration AND function!